I was at home for most of the day. My son, Eli went with Cliff for a little while to visit Brady, and when he came back he was in a very grumpy mood. We tried to clean his room together, but it didn't take long for me to see that cleaning his room was a bad idea. So, we ate lunch, and sat down together in the chair by the fireplace and read Narnia. I read one chapter, and that's all it took to put us both to sleep. I loved the nap, my nine year old wrapped in a blanket cuddled next to me, and sound asleep. We both slept very well, and when he woke up, he felt much better. After napping, the three of us, Eli, Ruby and I went for a hike up the hill to the freeway. 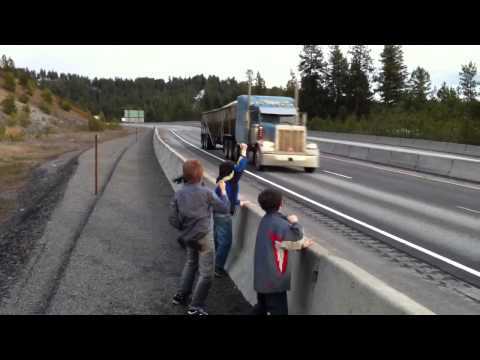 They love to go up this hill and then try to get all the semi-trucks to blow their horns. It works almost every time! It's about a mile hike, altogether and it's good for our hearts. On the way home, we made various stops to look at old deer bones, broken sticks, a squirrel, a stream, and some favorite forts. The sun was shining and it was a beautiful Spring day. After arriving back home, Eli was totally a new boy! He went upstairs and cleaned his room. Not only that he rearranged his furniture (every mother's dream--haha) Now, when I walk into his room, I run into his bed! But, it's clean, I can walk across the floor without falling over something. Isn't it just like life? It's like my life anyway. I can be very grumpy about the stuff in my life that needs a little cleaning up. I can stomp around and complain about the fact that I should deal with a particular issue, but then when I get myself fed from God, and rest in His compassion and peace, and take His grace, it's not so difficult. When I walk the walk with Him, take the hike up the hill towards His glory, I feel refreshed and ready to roll. I can surrender to His cleaning, and to His rearranging. It's better. So, I look at life right now, and I'm asking Him what He needs to clean in my life. What do I need to surrender to Him? It's still relationships. I have to give them to Him everyday. It's one in particular that I hope to reconcile, but it's not happening, so I have to continually give it to God for His arranging and His perfect timing. I have to give Him the emotions that go along with it. Anger, sadness, fear, loss, betrayal, and hope, all this stuff that I can stumble over unless I give it to Him to clean up and take for me. So, I continue to pray as I hike up the hill in life. Say That Again to me Lord Jesus. You will do the cleaning, the feeding, the rearranging. Thank you!